4D Ranch is located in the Hill Country of Texas, 85 miles northwest of San Antonio, and 55 miles southwest of Kerrville. 4D Ranch's Boer Goat entity, Lone Star Boer Goats, has produced, sold and exhibited many Champion and Reserve Champion Boer Goats. 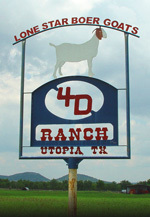 4D Ranch's Show Wether Goats and Meat Goats have taken many top honors at County Shows across the State in 1997 and 1998, as well as Reserve Grand Champion Meat Goat at the 1997 State Fair of Texas.